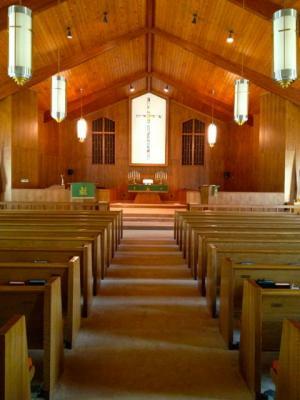 The "chapel" is our third sanctuary, and was dedicated in 1937. 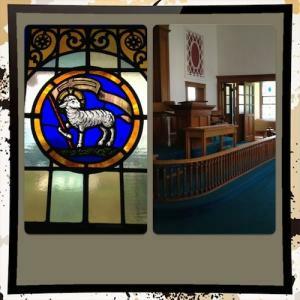 It is a traditional Protestant worship space that features a graded floor, centered pulpit, and beautiful stained glass windows. This sacred space is a reminder to all who enter that God's Word is the center of our life, and the windows tell the story of Jesus' life from birth to second coming. It is a beautiful space ideal for worship, seasonal celebrations, memorial services, weddings, and lectures. The main sanctuary was dedicated in 1969, the same Sunday Apollo 11 landed on the moon. This coincidence was ironic and fitting, as the main architectural feature is space. This building is an irregular shape which serves to embrace the changing times, yet hold firm to the central message of the Gospel - Jesus Christ, featured by the large stained-glass cross in the chancel. Many features make this space warm and spiritual, including the high ceiling (three-stories high), a seating capacity of 300 surrounded in natural wood, and explosed arches.